The connection between maternal supplementation and the health of the newborn is well-established. Pregnant women take prenatal vitamins rich in folic acid to help prevent neural tube defects, for instance, but folic acid is not the only supplement that affects the long-term health of your offspring. Research now shows that choline supplementation may reduce the impact of stress on your fetus well beyond birth. Choline reduces the impact of stress in the fetus for a lifetime. Stress was once thought to be merely an emotional response, but medical research has proven the impact is also physical. Prolonged periods of stress and intense bouts of stress can cause physical damage and illness. The women in the study were part of either a diet that included 480 mg of choline per day or 930 mg of choline per day. The recommended amount of choline intake for pregnant women is 480 mg per day. All diets were altered in the third trimester, so the increased intake of choline did not occur for the duration of the pregnancy. At birth, placental tissue, cord blood and maternal blood samples were taken to measure cortisol levels. Women in the group that consumed 930 mg of choline showed less cortisol than women in then 480 mg group. 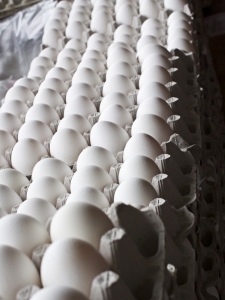 Without a doubt, the food highest in choline is the egg. One egg yolk contains 682 mg of choline. Beef kidneys and brain contain 513 and 481 mg of choline, respectively. More common foods that contain high levels of choline include whole egg, vegetable oil with soybean and chicken livers. Many of the foods with the highest amount of choline are rarely eaten in the western diet, so talking with a nutritionist about how to increase choline in the diet naturally could make food choices a bit easier.